I wanted to find some oasis for flower arranging my stunning marigolds from my garden. I thought they would make nice gifts, so I decided to do some research online to see what types there might be and where the best price would be. The craft store where I would have headed first thing had closed, and I didn't want to have to drive around to all kinds of possible stores in my city to track this stuff down, that would allow me to stick stems into the block of special foam, so my floral arrangements would look professional. I kept notes while I did this online research so I could show by example how to do this. These steps can be applied to anything at all that you might wish to check out before you buy - either online or off-line. 1. I opened my Firefox browser and went to Google. (Your browser also has a search bar in the upper area). There in the search box I entered "oasis for ..." While I was trying to decide what word to use next, the drop down list suggested some options. I clicked on "oasis for flower arranging" which is what I knew I wanted. On the search results page that followed, I browsed down the list, and right-clicked on several links to open a new tab on those sites, including a sponsored ad on the right, as it promised floral oasis with the words, "get cheap floral oasis Deals and offers. All the selection..."
When I had opened a number of links in different tabs of my Firefox browser, I began to visit the tabs one by one, looking for oasis for flower arranging. The first tab ended up being nothing but a page of ads -links. A link farm - yuk! (Obviously, I don't hold them in high regard). However, there were two links at the top that looked promising so I right-clicked to open them. One was a price-comparison site, and showed nothing to excite me. I closed it. The other was to afloral.com and it had nice pictures of oasis products of all kinds, right where I could see them, and see the prices too. I studied that for a minute or two and went on to see if there was anything better on the other tabs. 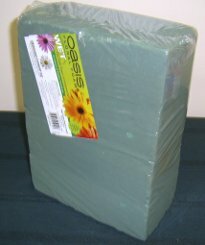 The next tab in my hunt for 'oasis for flower arranging' was for wholesalefloral.com and there I could get a nice big brick of green oasis for $1.49. Now to see if they will ship to Canada. I found a link on the left for shipping/Returns policy. That page had a big colour-coded map of the USA and Yukon and Hawaiian islands, but no mention of outside the USA. My hopes were dashed. But instead of closing that tab, I left it to come back to, and went to check some others. The one for that was a sponsored ad on the Google page came up. It turned out to be perfumes. So I closed that tab as soon as I realized it. All orders shipped to Canada are shipped via UPS. and are shipped on Tuesdays and Fridays only. All taxes and duties are calculated in the shopping cart. NO additional taxes will be due at time of delivery. Shipping charges are calculated at the checkout. Your order should be delivered within 7 business days after leaving our warehouse, however, Afloral.com is not responsible for delays at customs. After your order is shipped you will receive a UPS tracking number sent to your email address you provided. If you have any questions please call 1-888-299-4100. A bit further down is a note explaining for International customers how to use Bongo International to get the best delivery service. Hmm...! Well, I'm inclined to think UPS is rather expensive, but still I'm glad for this information. I may end up ordering here. Back to the google search page. I pick another link and open it in a new tab, and go to see it next. There's a big spot for a video, but since flash player is not working on this computer I ignore that. I spy the unique floral arrangement to the right and see a how-to link, so I take a minute to check that out. Okay, I learned a bit, but it's off my trail. Now to find Oasis. Oh, I spy a link called "where to buy" - on that page I find information for wholesalers, which implies this site is for the makers of oasis, but they don't sell directly to the public, just to wholesalers. Ah, there's a link that says "for all wholesalers in Canada." I try that. On this page I find 23 names and addresses in Canada. All in plain text. I skim down the list for any location near me in Saskatoon. It looks like they are all in Ontario or other provinces... Ah-ha! There is one in Saskatoon! Now I highlight that name, switch back to my google search page, and paste it into the box, to see if they have a website at all. I right-click and open a nuumber of new tabs for sites that mention them, but as I check them out it turns out the business doesn't have a website, it is just listed on these business directory sites. Offline for Oasis for Flower Arranging? Okay. I guess I can put this address on a piece of paper and try to drop in some time when I'm driving in that part of the city. Sitting still to think for a few minutes, I decide that ordering a brick of oasis for under $2 from the US is probably not the smartest use of my money. Not if I can get it locally without shipping costs. If I can't get it there, then I will remember afloral.com and order it from there, and maybe even look for another item or two as well. A couple of days later I did drive up that street and back and forth about three times, but could not find that store. Disappointing. Another couple of days later I was on the other side of the river and dropped in on the Michael's craft store in a big box area. 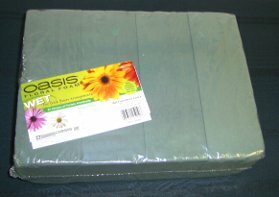 I found a package of six bricks of oasis for $5.99 which seemed reasonable enough, but I couldn't tell if that was the kind to use wet with real flowers, or if it was intended for silk flowers only. I asked at the checkout and the young cashier answered, "We only deal with artificial flowers here." So I carried it back. In the week or so following, I've got to wondering if she really knew the right answer. Perhaps it would work for real flowers. So back to Google I went yesterday. This time I put into the search box, "oasis for fresh flowers." A whole different page of results showed up. From this list I learn that there are in fact, two kinds of oasis. 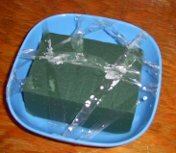 The dark green, or wet oasis is intended for fresh flowers to provide moisture for them to stay fresh as long as they can. The light green, more styrofoam type of oasis is intended for dried and artificial flower stems. It does not hold water. Oh my! In that case I think the clerk at Michael's may have been wrong. I should like to see that oasis again. Now I would be able to tell on my own. I find some good prices at http://www.save-on-crafts.com/floralfoams.html. Upon checking their shipping for international orders, I discover that they recommend we use shipping forwarders. - Ah, no! That's more expense and bother than I want with this. I realize that a $1/brick is a reasonable price, and if I can find it locally I'll not order online after all. In fact, my marigolds are nearly done so I won't be needing much oasis for this summer. When I buy it will be to lay away for next summer. (When I will plan on more flower types that lend themselves to use in oasis for flower arranging). I thought that concluded my research online for oasis, but in preparing this page, I have done a bit more research, and have learned that "oasis" is a brand name. I open up more possiblities for myself if I search by the generic name, floral foam. This foam comes in many colours, and I now doubted that the clerk at Michael's knew what she was saying. So I went back there to buy it. However, once in the store I realized that they did carry the type of oasis for 'wet' arrangements or for real flowers. They were just more expensive. By that time though I was fed up with this research and decided that it was worth my while to just buy this correct kind of oasis even if it was $9.98 for a package of only 4 instead of 6, as for the artifical flowers. 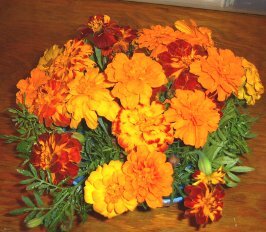 (As you can see, I've already cut off a piece and made my first arrangement with my marigolds, hastening to do that before the first hard frost of fall). It may appear to you that I went to a lot of bother, but really it was not that hard, and I fit the research in with other things. It just appears like an effort because I took time to describe it in great detail. The point of the exercise was to help you to see how to do some diligent research to benefit both your online and your off-line shopping.